Han Taiwanese or Taiwanese Hans (Chinese: 臺灣漢人) are a subgroup of Han Chinese (Chinese: 漢人) native to Taiwan, the largest ethnic group in the world. According to the Executive Yuan of the Republic of China, Han Chinese comprise 95 to 97 percent of the Taiwanese population, which also includes Austronesians and other non-Han people. Major waves of Han Chinese immigration occurred since the 17th century to the end of Chinese Civil War in 1949, with the exception of the Japanese colonial period (1895-1945). Han Taiwanese mainly speak three varieties of Chinese: Mandarin, Hokkien and Hakka. There is no simple uniform definition of Han Taiwanese, which are estimated to comprise 95 to 98 percent of the Taiwanese population. To determine if a Taiwanese is Han, common criteria include immigration background (from continental East Asia), using a Han language as the mother tongue, and observance of traditional Han festivals. Sometimes a negative definition is employed, where Hans are those who are not certain non-Han people. Taiwanese Hans can be classified according to the times of migration or places of origin. They include the Taiwanese Minnan and Hakka people that arrived in Taiwan before World War II and the post-World War II Han immigrants. From the view that Taiwan is one of the "provinces" of Republic of China, the former, along with the Austronesians, are sometimes called benshengren (Chinese: 本省人; literally: 'people of this province'), while the latter,[nb 1] along with the contemporaneous non-Han immigrants, are called waishengren (Chinese: 外省人; literally: 'people from other provinces'). These two terms and distinctions are now less important due to intermarriages between different sub-populations of Taiwan and the rise of the Taiwanese identity. In addition, there are Han Taiwanese that do not fall into the above categories, including the Puxian-speaking Hans in Wuqiu Island, Kinmen County, the Mindong-speaking in Matzu, and various recent Han immigrants from mainland China (forming part of the so-called "New Immigrants" (Chinese: 新住民). Traditional Minnan (Hokkien) architecture styled Lukang Longshan Temple. Lin Family Mansion and Garden, a traditional Han residence built in 1847. The ancestor of the Lin family came from Chang-chow, Hok-kien, Ching Empire in 1778. There were two major waves of Han immigration: from the Ching Empire in the 18th and 19th centuries and from the then Republic of China's continental territory, which is now ruled by the People's Republic of China, after World War II (1945-1949). The 1926 census counted 3,116,400 and 586,300 Hans originating from the Hok-kien and Kwang-tung provinces of Ching Empire or Ming Empire (roughly now Fujian and Guangdong of China, respectively). Around 800,000 people, the vast majority being Han, immigrated to Taiwan after the end of the Second World War, when Republic of China took over Taiwan, with the biggest wave taking place around the founding of the People's Republic of China in 1949. Since the mid-1990s, there has been a small amount of Chinese Han immigration into Taiwan. These mainly consist of two categories: brides of businessmen who work in China; and women who have married rural Taiwanese, mostly through a marriage broker. Around 20% or 34,000 of the Vietnamese people in Taiwan are Hoa people, people of Chinese origin that are mostly Han. Long-sek Ten (鄭用錫), a Minnan Taiwanese and author of On Reconciliation (Source of Photo: 台灣文化誌 by Kanori Ino). There were violent ethnic conflicts (termed "分類械鬥" in government documents of the Ching Empire), which played a major role in determining the distribution of different groups of Han peoples in Taiwan. Most conflicts were between people of Chang-chow and Chin-chew origins which includes acts where Quanzhounese fought against Hakka peasants from the southwestern hills of Fujian (Tingzhou and western Zhangzhou) throughout the period. ("漳泉械鬥", Chang-Chin conflicts) and between people of Hokkien and Hakkas origins ("閩粵械鬥" [Min-Yue conflicts]) where Hoklo people united to fight against the Hakkas who largely came from Guangdong and a minority from Fujian, is called ("閩客械鬥" [Min-Hakka conflicts]). Trying to be a mediator, Ten Long-sek (鄭用錫, 10 June 1788 – 21 March 1858), the first Taiwanese to achieve the highest degree, jinshi or “Doctor” (Mandarin: 進士), in the imperial examination of the Ching Empire, wrote an article On Reconciliation (勸和論). Similar literary works on conflicts between different ethnic subgroups include Hái-Im Poems (海音詩) by Lâu Ka-Bôo (劉家謀, 1814-1853) and To the Min and Yue people (諭閩粵民人) by Nâ Tíng-Guân (藍鼎元, 19 September 1680 - 1 August 1733). In some regions. where the majority of the population spoked another language, the minority group sometimes adopted the more dominant language and lost their original language. They are called "minnanized" Hakka people (福佬客). There were also conflicts between people with different surnames, such as those between different clans in Yilan. While Hans in some other places were prohibited from marrying others with the same surname, Hans in Yilan were discouraged from marrying others with a different surname. Unlike pre-World War II, when Han immigrants were predominantly of Hok-kien and Hakka origins, post-World War II Hans came from all over mainland China. Their different languages, habits, ideologies and relationships with the Republic of China government sometimes led to conflicts between these two groups. In Taiwan, the Hans came into contact with the Austronesians, Dutch, Spanish and Japanese. The Amis term for Hans is payrag. According to the historian Melissa J. Brown, within the Taiwanese Minnan (Hoklo) community itself, differences in culture indicate the degree to which mixture with Austronesians took place, with most pure Hoklo Han in Northern Taiwan having almost no Austronesian admixture, which is limited to Hoklo Han in Southern Taiwan. Plains aborigines who were mixed and assimilated into the Hoklo Han population at different stages were differentiated between "short-route" and "long-route". The ethnic identity of assimilated Plains aboriginals in the immediate vicinity of Tainan was still known since a Taiwanese girl from an old elite Hoklo family was warned by her mother to stay away from them. The insulting name "fan" was used against plains aborigines by the Taiwanese, and the Hoklo Taiwanese speech was forced upon Aborigines like the Pazeh people. Hoklo Taiwanese has replaced Pazeh and driven it to near extinction. Aboriginal status has been requested by plains aboriginals. In Taiwan, the prevalence of alcohol dependence among Hans is 10 times lower than that of Austronesians, which is related to genetic, physical, psychological, social, environmental, and cultural factors. An association study by researchers at the Academia Sinica found that genes in alcohol metabolism pathway, especially ADH1B and ALDH2, conferred the major genetic risk for alcohol dependence in Taiwanese Han men. Most commonly used languages in Taiwan, showing the difference in percentage between the most commonly and the second most commonly used language at home for each township/district. cmn: Taiwanese Mandarin; nan: Taiwanese Hokkien; hak: Taiwanese Hakka; map: Taiwanese Austronesian languages. The languages used by Han Taiwanese include Mandarin (entire country), Hokkien (Taiwan proper and Kinmen), Hakka (Taiwan proper), Mindong (Matzu), Puxian (Wuqiu Island, Kinmen), and other Han languages spoken by some post-World War II immigrants or immigrants from mainland China since the 1990s. The writing systems used include Han characters, Han phonetic notations such as Mandarin Phonetic Symbols for Mandarin and Taiwanese Phonetic Symbols for Minnan and Hakka, and the Latin alphabet for various romanization systems, including Tongyong Pinyin, Wade–Giles, Gwoyeu Romatzyh and Mandarin Phonetic Symbols II for Mandarin, POJ and Taiwanese Minnan Romanization System for Minnan, and Hakka Romanization System for Hakka. Significant numbers of Puxian Min, Fuzhounese, and Teochew speakers came to Taiwan proper, but they were eventually assimilated into the Hokkien (Minnan) speaking population. The Taiwanese linguist Uijin Ang divided Taiwan (excluding Kinmen and Matsu) into 7 linguistic regions, including one Austronesian, five Han and one mixed. Ever since the arrival of Han immigrants in Taiwan, their languages have undergone changes through interactions with other Han or non-Han languages. For example, one unit of land area used in Taiwanese Minnan is Kah (甲; 0.9699 acre), which comes from the Dutch word for "field", akker (akker > 阿甲 > 甲). Yehliu (野柳, Iá-Liú in Minnan), a scenic area in northern Taiwan. Its name came from the Castilian name given by the Spaniards, Punto Diablos, which means 'Cape Devils'. 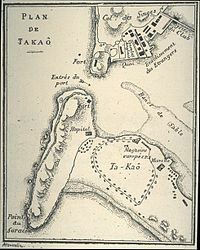 Takau/Takao is the old name of Kaohsiung. Minced pork rice, a rice dish of Han Taiwanese. Minced pork rice in Taichung. Rice blood cakes to be fried. Oyster omelet in Lugang, Changhua. The most popular religions of Han Taiwanese are Taoism and Buddhism. With 11,796 temples (78.4% Taoist; 19.6% Buddhist), Taiwan is the country with the highest density of temples in the world. Manka Longshan Temple, a Taoist-Buddhist temple in Taipei. In traditional Han society, children inherit the surname of the father. Population analyses of Han Taiwanese based on the short tandem repeat sequences on the Y chromosome, which is specific to males, shows high haplotype diversity in most surname groups. Except for rare ones, the origins of Han surnames in Taiwan are pretty heterogeneous. The naming customs of the Austronesian people in Taiwan have been greatly endangered by the dominant Han culture under the rule of Ching and Republic of China or Japanese culture during the Japanization period. Austronesians were often forced to have surnames in Han characters that, depending on the policies then, may or may not be related to their original surnames. Confucian temples formed an important part of the life of early Han immigrants. 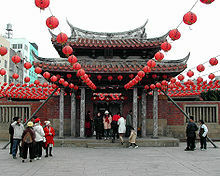 Famous temples include Taiwan Confucian Temple and Taipei Confucius Temple. One of the earliest written records of Taiwanese Hakka is A Tragic Ballad about Hakka Sailing to Taiwan (渡台悲歌), a work written in the Raoping dialect about the life and struggle of Hakka immigrants to Taiwan under the Ching rule. One of the best known Han folktales in Taiwan is the Grandaunt Tiger. House of Ten Long-sek (鄭用錫), a Minnan Taiwanese building and a national monument of Taiwan. Lin An Tai Historical House and Museum, a Minnan-style courtyard. Hakka Taiwanese have long traditions of indigo dyeing. The Yilan International Children's Folklore and Folkgame Festival exhibits collections of traditional Han Taiwanese toys. ^ They also include some Minnan and Hakka people. ^ This number was inferred from the Han population size of 3,751,600 and their proportion of ~90% in the total population. ^ Numbers including all nationals who have a Han name, including many Austronesians, who were until 1990s forbidden to possess their traditional names. See Taiwanese aborigines. ^ Lane, H. Y.; Liu, Y. C.; Huang, C. L.; Chang, Y. C.; Liau, C. H.; Perng, C. H.; Tsai, G. E. (2008). "Sarcosine (N-Methylglycine) Treatment for Acute Schizophrenia: A Randomized, Double-Blind Study". Biological Psychiatry. 63 (1): 9–12. doi:10.1016/j.biopsych.2007.04.038. PMID 17659263. ^ Hou, T.-Y. ; Chen, H.-C.; Chen, C.-H.; Chang, D.-M.; Liu, F.-C.; Lai, J.-H. (2007). "Usefulness of human leucocyte antigen-B27 subtypes in predicting ankylosing spondylitis: Taiwan experience". Internal Medicine Journal. 37 (11): 749–752. doi:10.1111/j.1445-5994.2007.01450.x. PMID 17908086. ^ Ahern, Emily M.; Gates, Hill (1981). The Anthropology of Taiwanese Society. Stanford University Press. ISBN 978-0804710435. ^ Tai, Eiko (1999). "Kokugo and colonial education in Taiwan" (PDF). Positions. 7 (2): 503–540. doi:10.1215/10679847-7-2-503. ^ Wu, G.-Q. ; Zhao, Y.-M.; Lai, X.-Y. ; Yang, K.-L.; Zhu, F.-M.; Zhang, W.; Wang, W.; Luo, Y.; Tan, Y.-M.; Wang, Y.-J; Cao, W.-J. ; Huang, H. (2009). "Distribution of killer-cell immunoglobulin-like receptor genes in Eastern mainland Chinese Han and Taiwanese Han populations". Tissue Antigens. 74 (6): 499–507. doi:10.1111/j.1399-0039.2009.01366.x. PMID 19761533. ^ Chen, Wei J.; Loh, E. W.; Hsu, Yun-Pung P.; Chen, Chiao-Chicy; Yu, Jeng-Ming; Cheng, Andrew T. A. (1996). "Alcohol-metabolising genes and alcoholism among Taiwanese Han men: independent effect of ADH2, ADH3 and ALDH2". British Journal of Psychiatry. 168 (6): 762–7. doi:10.1192/bjp.168.6.762. ^ 漢人村莊社會文化傳統資料庫 [Database for the Society, Culture and Customs of Han Villages] (in Chinese). Retrieved 30 May 2015. ^ a b Lin, Bao-Shun (2012). 台灣漢人的姓氏與Y染色體STR單倍型的關聯性分析 [Analysis of the association between surnames and Y-chromosomal STR haplotypes in the Taiwanese Han population] (Master). National Taiwan University. ^ a b Lin, Yi-Wen; Chia-Ling Hsu, Lea; Kuo, Pao-Lin; Huang, William J.; Chiang, Han-Sun; Yeh, Shauh-Der; Hsu, Tuan-Yi; Yu, Yueh-Hsiang; Hsiao, Kuang-Nan (2007-05-01). "Partial duplication at AZFc on the Y chromosome is a risk factor for impaired spermatogenesis in Han Chinese in Taiwan". Human Mutation. 28 (5): 486–494. doi:10.1002/humu.20473. ISSN 1098-1004. PMID 17285591. Here we report our characterization of the AZFc region in Han Chinese in Taiwan (Han Taiwanese) that make up 98% of the population. ^ Wen, B.; Li, H.; Lu, D.; Song, X.; Zhang, F.; He, Y.; Li, F.; Gao, Y.; Mao, X.; Zhang, L.; Qian, J.; Tan, J.; Jin, J.; Huang, W.; Deka, R.; Su, B.; Chakraborty, R.; Jin, L. (2004). "Genetic evidence supports demic diffusion of Han culture". Nature. 431 (7006): 302–305. doi:10.1038/nature02878. PMID 15372031. ^ a b Executive Yuan, R.O.C. (2014). The Republic of China Yearbook 2014 (PDF). ISBN 9789860423020. Retrieved 2016-06-11. ^ Klöter, Henning (2004). "Language Policy in the KMT and DPP eras". China Perspectives. 56. ISSN 1996-4617. ^ a b c Ang, Uijin (2013). "The distribution and regionalization of varieties in Taiwan" (PDF). Language and Linguistics. 14 (2): 315–369. ^ a b Chen, Shu-juo; Duan, Hong-kuan (2008). "Plains Indigenous Ancestors and Taiwan Blood Nationalism". Taiwan: A Radical Quarterly in Social Studies. 72. ^ a b Hsieh, Shih-Chung. 1998. Three Definition of Hanren：Images of the Majority People in Taiwan. ^ Lo, Seogim (2006). "Origin of the Hakka Language" (PDF). Language and Linguistics. 7. ^ Brown, Melissa (2004). Is Taiwan Chinese? : The Impact of Culture, Power, and Migration on Changing Identities. University of California Press. ISBN 9780520927940. ^ a b Wang, Fu-chang (2002). 族群接觸機會？還是族群競爭？：本省閩南人族群意識內涵與地區差異模式之解釋 (PDF). 台灣社會學 (4): 11–74. ^ Zhou, Qionghui (周璟慧) (2008). 外省客家人的認同與文化：以廣東省五華縣籍為例 [Identity and Culture of Hakka Mainlanders:A case study on the Immigrants of Wu Hua County, Guandong Province] (Master). National Kaohsiung Normal University. ^ Dittmer, Lowell (2004-01-01). "Taiwan and the Issue of National Identity". Asian Survey. 44 (4): 475–483. doi:10.1525/as.2004.44.4.475. JSTOR 10.1525/as.2004.44.4.475. ...although nearly 98% of the island's population are Han Chinese, there is a slight complication in terms of ethnic origins that has led to the coagulation of two distinguishable groups (sometimes called subethnic groups, because both are Han Chinese). These consist of (1) those whose ancestors migrated from the mainland in or since the 17th century, known as benshengren, or natives of the province, and (2) those who sought refuge (or whose parents sought refuge) from the mainland in the wake of the Nationalists’ loss of the Chinese civil war in 1946–49, commonly referred to as waishengren, or provincial outsiders. ^ a b c Formosa Television (Aug 25, 2014). Taiwan History - Taiwan's history of ethnic strife. ^ a b c d e f Chen, Kongli (1990). 清代台湾移民社会研究 [Studies on the Immigrant Society of Taiwan under the Ching Dynasty]. Xiamen: Xiamen University Press. ^ a b Hsu, Shih-Rong (2013). "The first features of Taiwanese ancestral places and ethnic distributions in the beginning of the 20th century: Graphical presentation of the statistic data from Relative Investigations of Formosa Development and History by the Taiwan Sotokufu in 1901" (PDF). Journal of Geographical Research. 59: 91–126. ^ a b c d Taiwan Sotoku Kanbo Chosaka (1928). 台灣在籍漢民族鄉貫別調查 [Investigation of the regions of origin of Han people in Taiwan]. Taihoku-shi (Taipei): Taiwan Sotoku Kanbo Chosaka. ^ a b 臺灣省政府主計處 (1953). 臺灣第七次人口普查結果表 [The seventh population census of Taiwan]. 臺灣省政府主計處. ^ a b 臺灣省戶口普查處 (1959). 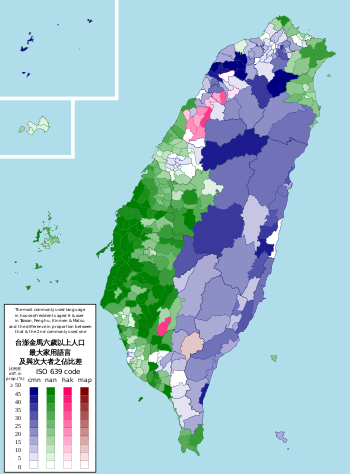 中華民國戶口普查報告 [The seventh population census of Taiwan]. 臺灣省戶口普查處. ^ Wang, Hong-Zen (March 2001). 社會階層化下的婚姻移民與國內勞動市場：以越南新娘為例 [Social Stratification, Vietnamese Partners Migration and Taiwan Labour Market]. Taiwan: A Radical Quarterly in Social Studies (in Chinese) (41): 99–127. Archived from the original on 2011-07-19. Retrieved 2008-01-23. ^ Taiwan Bar Studio (Oct 10, 2015). 【故事・臺北】 第二話 -『士林生死鬥』 [Story of Taipei (Episode 2): Shilin DOA] (Motion picture). Taipei. ^ "On Reconciliation (original text with Mandarin translation)". Retrieved 6 November 2015. ^ 認識福佬客. Hakka Affairs Council, Taiwan. 25 Jan 2006. Retrieved 14 November 2015. ^ LIAO, SZE-WEI (2010). Identity, Ideology, and Language Variation: A Sociolinguistic Study of Mandarin in Central Taiwan (PDF) (PhD). UNIVERSITY OF CALIFORNIA Davis. Retrieved 30 August 2016. ^ Brown 2004. pp. 156-7. ^ Brown 2004. p. 162. ^ Brown 2004. p. 157. ^ "Pazeh writers get awards for preserving language - Taipei Times". ^ "Pazeh poets honored at ceremony - Taipei Times". ^ "Pingpu activists demand government recognition - Taipei Times". ^ The, HUGO Pan-Asian SNP Consortium (2009). "Mapping human genetic diversity in Asia". Science. 326 (5959): 1541–5. doi:10.1126/science.1177074. PMID 20007900. ^ Huang; Chen (2012). "Alcohol Dependence in Taiwan: From Epidemiology to Biomedicine". Journal of Experimental & Clinical Medicine. 4 (2): 108–12. doi:10.1016/j.jecm.2012.01.004. ^ Wu; Lee (2016). "Association Study of Gene Polymorphisms in GABA, Serotonin, Dopamine, and Alcohol Metabolism Pathways with Alcohol Dependence in Taiwanese Han Men". Alcoholism: Clinical and Experimental Research. 40 (2): 284–90. doi:10.1111/acer.12963. PMID 26842247. ^ a b Weng, Jiayin (翁佳音); Cao, Mingzong (曹銘宗) (2015). 大灣大員福爾摩沙. 貓頭鷹. ^ Chung, Raung-Fu (2014). "An investigation of Hakka nativization in Taiwan". Journal of Taiwanese Languages and Literature. 9 (1): 29–54. ^ HOU, CHAO HWEI (2012). 台灣日治時期漢人飲食文化之變遷：以在地書寫為探討核心 [The Transformation of Taiwan Han Dietary Culture in the Japanese Colonial Period：A Case Study of Local Writing Literature] (Master). National Taiwan Normal University. ^ 客家飲食文化的成因與特色. Hakka Affairs Council. ^ Chang, Hsun (1996). 光復後臺灣人類學漢人宗教研究之回顧. 中央研究院民族學研究所集刊 . 81. ^ 台宗教密度高 寺廟教堂逾萬座. Central News Agency (Taiwan). 7 July 2010. Retrieved 6 November 2015. ^ 全國1,510姓氏 陳林滿天下 內政部《全國姓名統計分析》全新出版. Executive Yuan, Taiwan. 29 October 2014. Retrieved 6 November 2015. ^ Liu, Shu-Win (2009). 台灣孔廟之敘事分析研究 [A study on Taiwan Confucius Temples from Narrative Theory] (Master). National Yunlin University of Science and Technology. ^ Chien, Chi-Ru (2013). 臺灣虎姑婆故事之深層結構─以自然與文化二元對立觀之 [The Research for Structural Analysis and Folk Investigation of Taiwan's Grandaunt Tiger Story] (PDF). 成大中文學報 . 22. ^ 潘國正 (1997). 新竹文化地圖 [A Cultural Map of Hsinchu] (in Chinese). 齊風堂出版社. ^ 潘國正. 台灣傳統建築欣賞 [The Appreciation of Taiwan Traditional Architecture] (in Chinese). ^ a b Chiou, S-C; Krishnamurti, R (1995). "The fortunate dimensions of Taiwanese traditional architecture". Environment and Planning B: Planning and Design. 22 (5): 547–562. doi:10.1068/b220547. ^ "Indigo dyeing renaissance in Hakka village". Retrieved 13 Sep 2016. ^ "Hakka Taiwan". Retrieved 13 Sep 2016. ^ "Yilan International Children's Folklore and Folkgame Festival". Retrieved 13 Sep 2016. ^ Yang, Li-Chu. 台灣歌謠與生活. 臺灣源流. ^ 丟丟銅仔 - 黃思瑜編曲 [Due Due Dong -- ar. Ssu-Yu Huang]. YouTube. 2011-04-29. ^ a b (月琴之友Yueqin Friends) 陳達 思想起 (祖先堅心過台灣). YouTube. 2010-11-14. ^ 《客客客棧》EP3 超前衛！超多元！超害羞！客家音樂 (in Chinese). Hakka TV. 2016-08-11. ^ Weng, Jia-Yin (1986). 台灣漢人武裝抗日史研究：一八九五～一九O二. National Taiwan University Press. ^ Yang, Shuyu (楊書育) (2014). 論台灣族群與二二八、白色恐怖、眷村訴訟戰: 台灣228,白色恐怖,原住民,外省人與眷村研究. ISBN 978-9574320165.